ASRock BIOSes have two modes, an EZ Mode and Advanced. 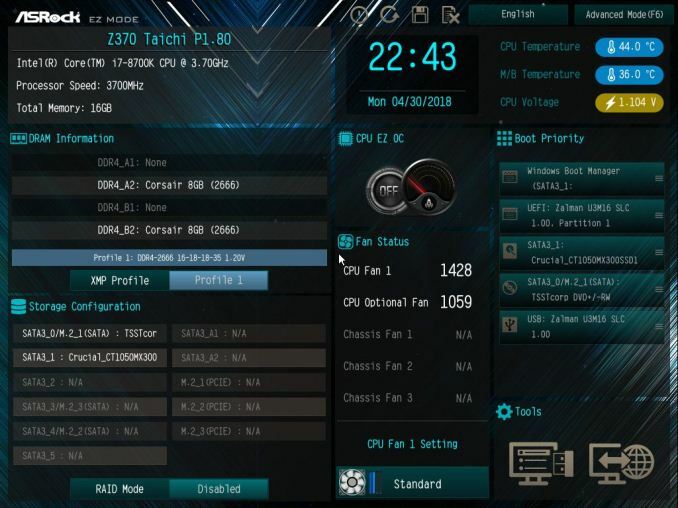 EZ Mode is intended to display high-level information as well as give users a couple of common options to adjust before getting into the more detailed advanced portion of the BIOS. Unlike the Z370 Gaming-ITX/ac, the black and blue theme carries over through the advanced mode as well. Above we see EZ Mode displaying information to users in a dashboard type format relaying high-level system information from CPU type and its speeds plus temperatures, memory capacity and speed, attached drives, and even fan status. Users can enable XMP profiles for the memory, enable RAID, adjust boot priority, and adjust fans from this screen. There is also an EZ OC function to enable one-click overclocking for the system. Our first glimpse of the advanced version of the BIOS displays a list of several headings across the top. The section is labeled Main. 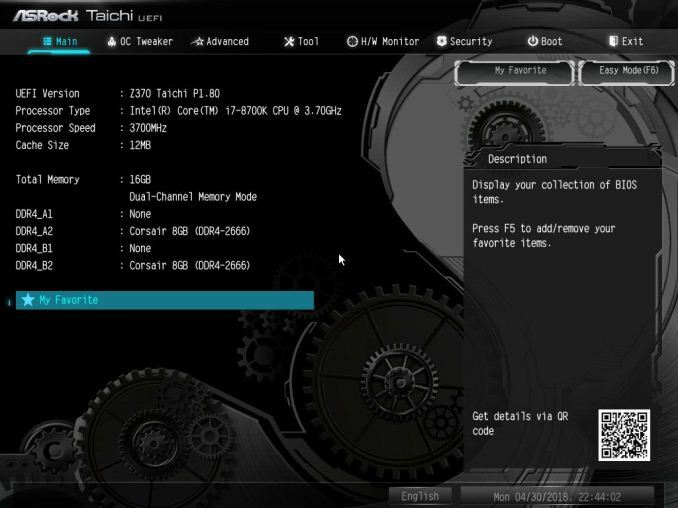 Here we will again find high-level system information about the CPU, UEFI version, as well as the installed RAM. This section also contains the 'My Favorite' section, a customizable page that has some of the more commonly used functions in one location. The OC Tweaker section is where any system adjustments will be made in regards to overclocking and tweaking the CPU itself. Under this heading, ASRock separates CPU, DRAM, and Voltage configurations in their own sub-headings. The CPU configuration section has options to adjust core and cache ratios, BCLK as well being able to sett AVX offsets (among many other options). The DRAM configuration section contains almost all things DRAM. From speeds and XMP profiles to memory timings can all be found in this subsection. The voltage section is where users will find the major voltage domains such as CPU Core/Cache, DRAM, VCCSA, and VCCIO among others. If the plan is to overclock the PC or mess with voltages, this is the section where the lion's share work will be done. 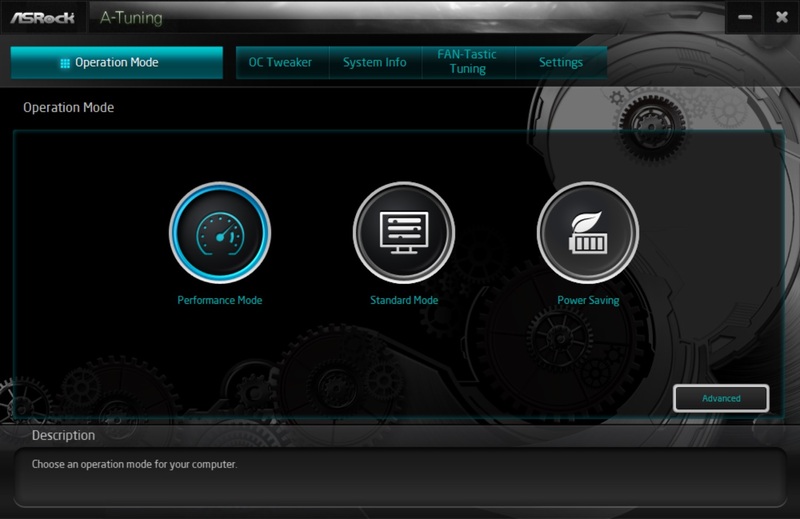 This is nice and neat, though I personally prefer to have all the overclocking items in one section. It can be a minor pain to have to back out and jump in other sections when overclocking. 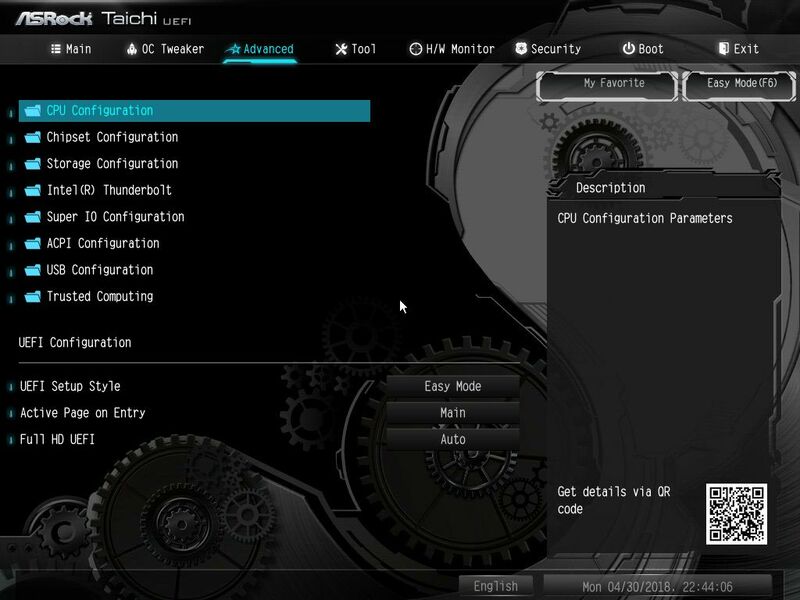 The Advanced section displays multiple sub-headings from CPU configuration, Chipset, and Storage configuration, as well as SUper UO and USB sections. 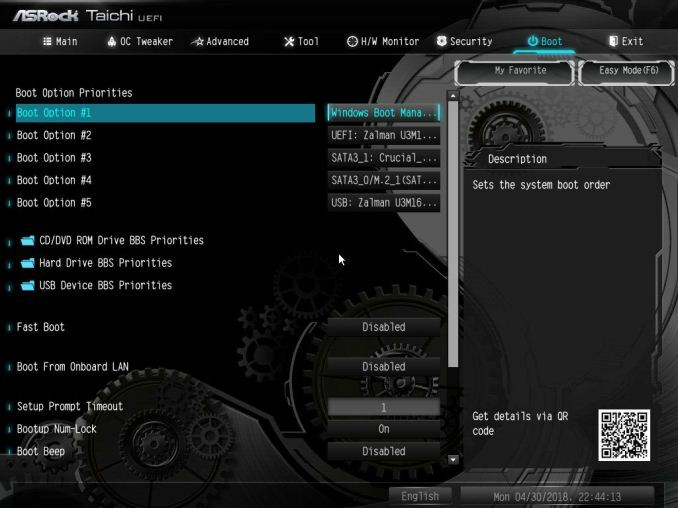 Also included here are UEFI configuration parameters such as default screen as well as the landing page when entering the BIOS. The Tool section has several options underneath from a UEFI version of the RGB LED software, a RAID installer, and even a boot manager. Also found here are UEFI update utility options such as instant flash (from USB), to an internet flash that will go to the ASRock website and check for the latest BIOS versions. 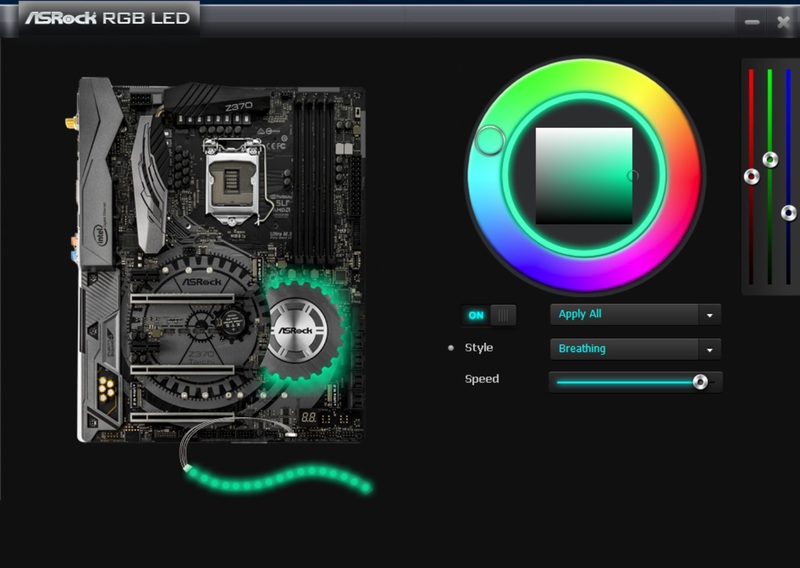 The H/W Monitor section is where users can see temperatures of the motherboard and CPU, fan speeds, as well as major voltages for the system as well as from the power supply. A bit further down is the Fan-Tuning section. 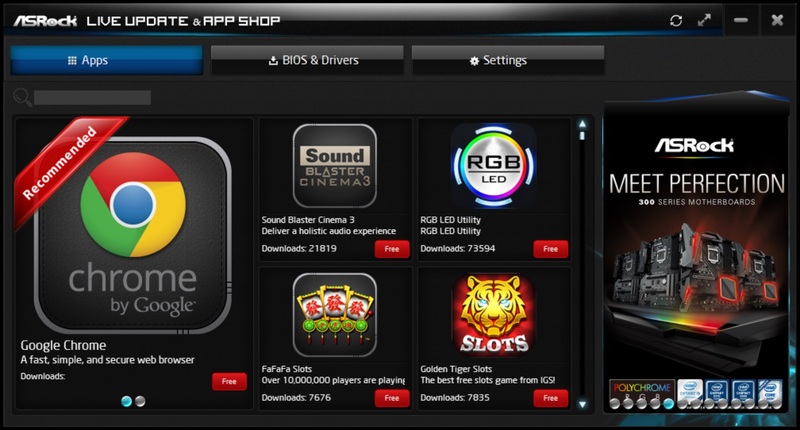 Here users are able to control the system fans/pumps as well as create custom profiles. 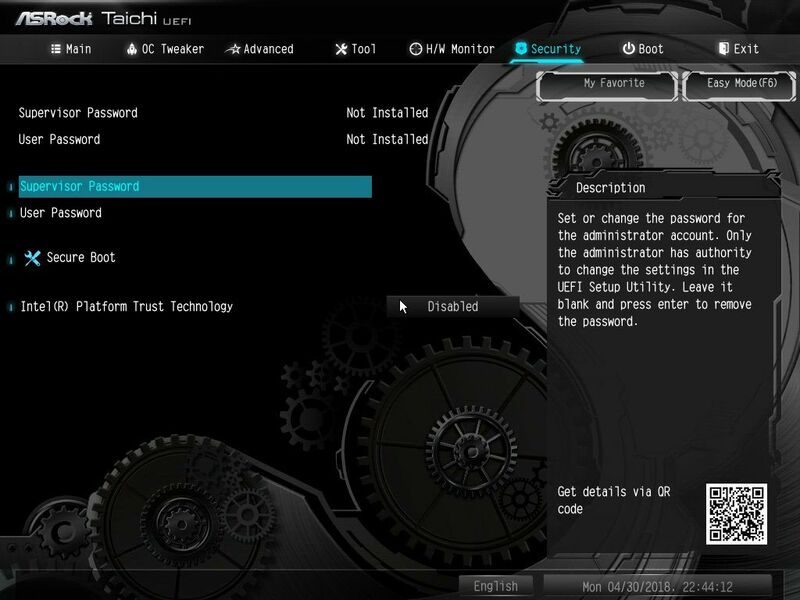 The Security section is where users can create a BIOS password to get into the system as well as edit Secure Boot options. The boot section holds the vast majority of options associated with booting the PC from boot options and priorities to fast boot and num-lock options among others. Anything boot related will be located here. Moving on to software, like all board partners, ASRock includes drivers to get started as well as several 'value- add' type applications with the board. These can be found either online at the motherboard's webpage, or through the driver disk and Live Update/App Shop application. 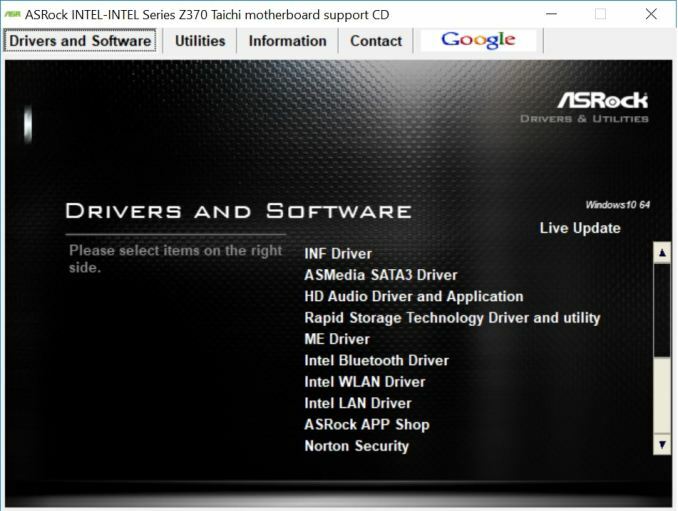 The above image is from the motherboard support CD which includes both the drivers to get the PC up and running properly, as well as other software and utilities included with the board such as the ASRock RGB LED application and a nifty Restart to UEFI function which restarts the computer to the BIOS without hitting buttons. 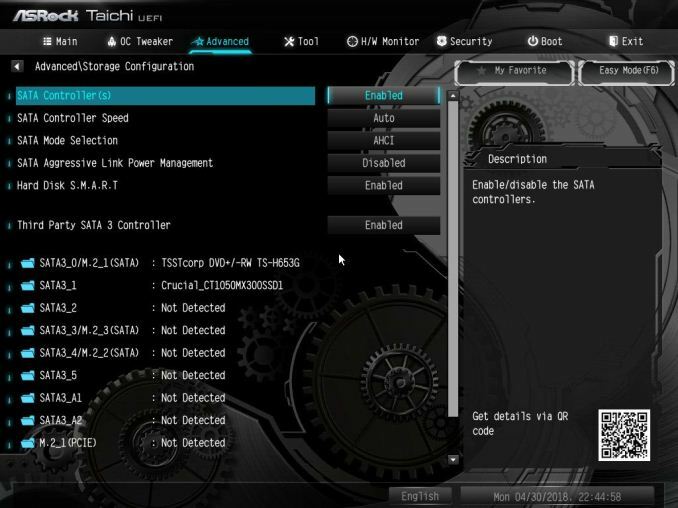 ASRock also offers their Live Update & App shop as a source for keeping the ASRock applications up to date, as well as the BIOS and drivers. The tray-based application will phone home to the ASRock website, compare installed versions with the latest available, and alert users an update is available. ASRock also includes an application called A-Tuning. 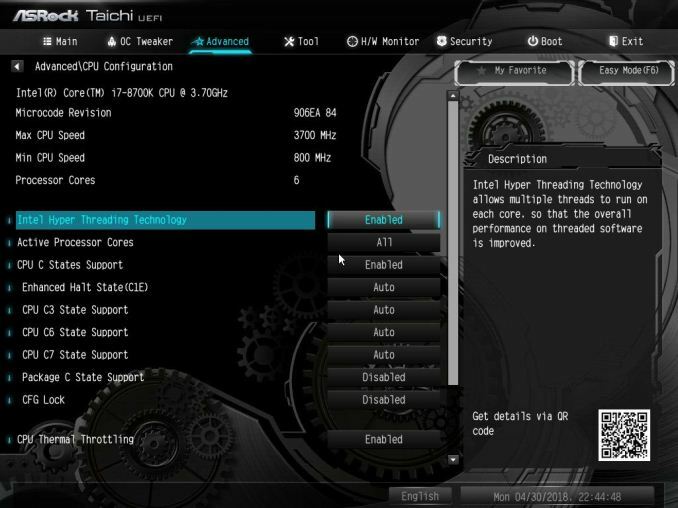 A-Tuning is the same software called F-Stream we looked at on any Fatal1ty based ASRock boards, but with a non-Fatal1ty theme. 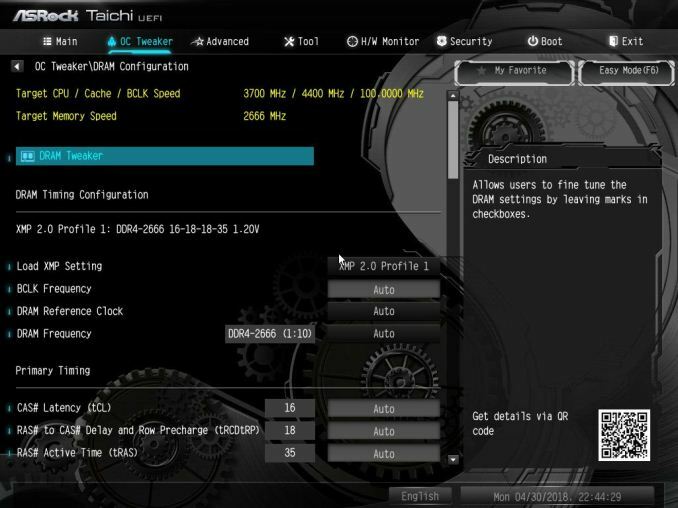 The A-Tuning utility is designed as both a monitoring tool as well as a Windows-based overclocking tool. It allows users to monitor system health in the System Info section, overclock in the OC Tweaker section, and allow for fan adjustment and custom fan curves in the Fan-Tastic Tuning section. Its a one-stop shop for system control within Windows. In order to control the integrated RGB LEDs on board as well as any attached to the onboard header, ASRock usees their RGB LED software. It includes several different styles as well as speed and color adjustments. Changes can also be made through the BIOS which also includes a version of this software. 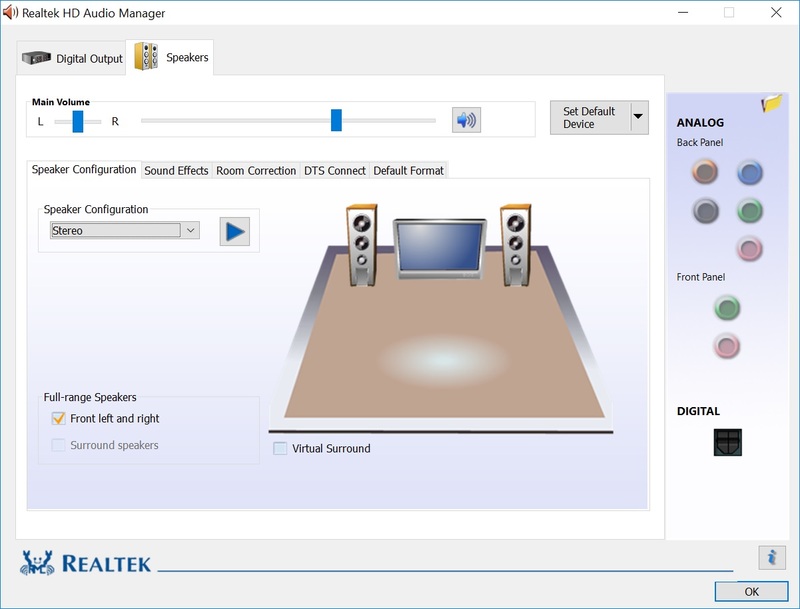 ASRock uses the Realtek ALC1220 codecs for the Z370 Taichi which includes the Realtek software for changing the sound to your liking. 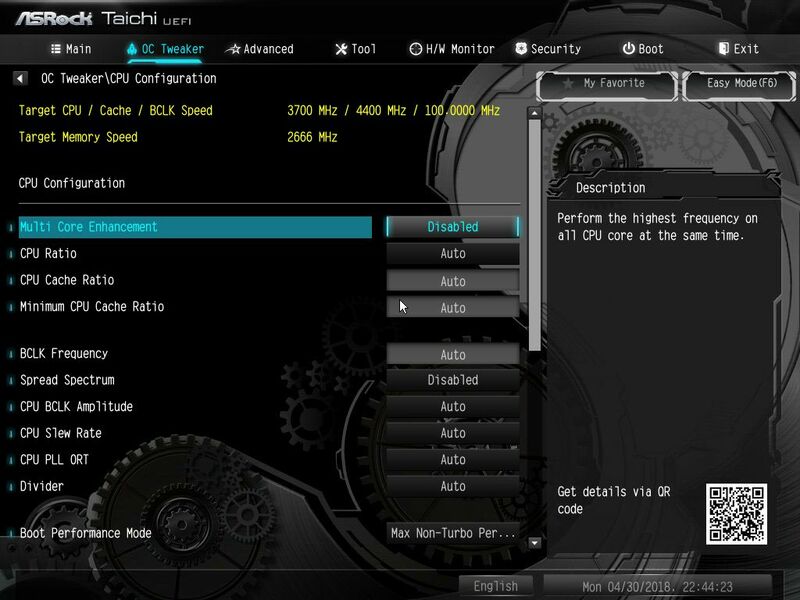 Unlike the Z370 Gaming-ITX/ac the Taichi does not include additional sound shaping software.